Caption : HYDERABAD (AP) -16-08-2010 -- ( WITH REPORT BY VRK) - Mr.Shiv Kiran , COO , Mahindra First Choice announcing the launch of Mahindra First Choice Wheels in Hyderabad on Monday . 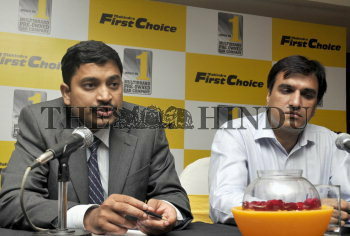 Beside him is Mr. Asheesh Dhar , Vice-President , Operations , Mahindra First Choice . PHOTO: P_V_SIVAKUMAR.